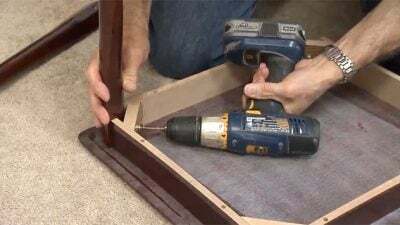 If you’ve assembled furniture, you know it can be a slow process to tighten all the fasteners with a hex key wrench, also known as an Allen wrench. I thought I would introduce a little power with a drill. Start by securing the hex key wrench in a vise and cutting off the shorter end of the wrench with a hacksaw or grinder. Chuck the straight piece of wrench in a drill and set the torque on the lowest setting, so it will slip instead of damaging the piece or fastener. Great tips, everyone has a wobbly leg on a chair somewhere in the house. Thanks for sharing! You remodeled your bathroom and used a solution in the shower to help prevent mold. Its been a year or 2 when the show was aired. Please advise thank you.